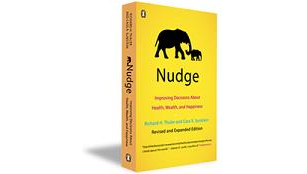 Richard Thaler’s 2017 Nobel Prize for Economics “nudged” me into finally reading the New York Times Bestseller NUDGE on the illogical nature of many default human behaviours. Thaler proposes that those of us interested in changing human behaviour and systems should learn how to re-engineer them so that it’s easier to make good choices – a process he call “Choice Engineering”. Supermarket designers apply choice engineering all the time, from putting chocolates at the checkout to displaying high-margin items at eye-level while budget brands languish at floor level. Subscriptions that automatically renew and using a habitual parking space at work are other examples of automatic behaviours that we simply repeat without conscious consideration. Traditional economics regarded humans as logical decision-makers, who make the best possible decision on the information they have available. A more up-to-date understanding of human perception, human decision-making and human emotions is that we are busy people struggling to cope in a complex world – a world in which our brains cannot afford the energy to think deeply about every choice we have to make. We operate on rules of thumb, using what we know to estimate what we don’t know. In a bargaining situation, the setting of a high initial price sets a scale for the end price. We assess risks on the information that’s most available and most recent, not on the actual level of danger. Flood insurance gets a boost just after a flood – but that drops over time. We hate losses more than we love gains. So an operation that has a “90% success rate” sounds a whole lot better than one that has a “10% failure rate”. We’re generally over optimistic about our capabilities. Most of us think that we’re “better than average drivers” – regardless that “average” is a statistical measure. We find it easier to stay with the status quo than make a change. Which is why automatic subscriptions work – and an automated savings plan works better than one that requires an active decision each month. Thaler’s books offer examples of systems changes that can ethically nudge people in the direction of choices that will improve their lives. In one NUDGE example, food waste in canteens was reduced simply by removing trays – so people were limited to what they could carry on a plate. Recycling rates are substantially improved by matching the shape of lid of the recycling bin to what’s being recycled, such as small circles for cans and bottles, slits for paper. What would nudge Drawdown solutions forward? Project Drawdown published the first ever research into reversing global warming and shifting to an economy that consumes greenhouse gases using current technology in April 2017. How could we engineer better choices that shift us towards more beneficial Drawdown actions? What would contribute to better refrigerant gas management, reduced food waste, educating girls, the take-up of silvopasture or eating more vegetables? WIIFM – or would WAIMOO be more powerful? 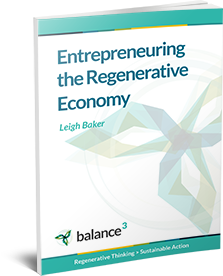 If economic decisions were rational, the financial benefits of being sustainable (such as Interface’s $393,000,000 savings) would have started a major industry shift to a regenerative economy decades ago. Read Nudging: A Very Short Guide for a quick introduction to the subject.